Nothing beats a romantic breakfast on Valentine's Day! These simple and easy recipes are super manageable and so delicious! Sweet and savory recipes include cinnamon rolls, pomegranate mimosas, and bacon hearts! Egg-In-A-Hole, the perfect all-inclusive breakfast! Eggs and bread all in one! Make it look adorable for Valentine's Day by cutting out the hole with a heart-shaped cookie cutter! So easy and adorable! There's something so sweet and romantic about cinnamon rolls. They are so tasty and decadent, warm and gooey, and fun to share! You can easily make a pan of these ahead of time and bake them up freshly on Valentine's Day morning! Bring them to a loved one or your coworkers! Heart-shaped bacon is so cute! 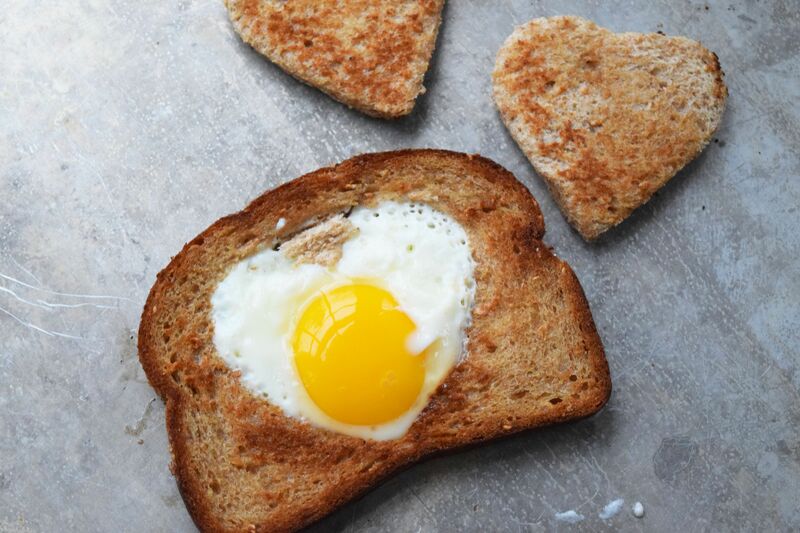 It's super simple to make and looks adorable on a Valentine's Day breakfast plate. Pomegranate mimosas are the bomb! They look so pretty and sweet for Valentine's Day. It's super simple to whip them up in the morning to surprise your loved one! You can easily make them non-alcoholic with different sparkling seltzers. Wow...croissants, Nutella, cream cheese, and strawberries? Yeah, this French Toast has got it goin' on! It has everything you could ever want in a french toast! It is super easy to make and can be done as an overnight bake! Simply bake for an hour in the morning and you can feed your loved one some decadent breakfast in bed! Cranberry cherry scones are simple to whip together and are absolutely delicious! The cute heart shape make them perfect for Valentine's Day. You can add a sweet glaze too and serve them with tea for a sweet, perfect breakfast! Nothing beats authentic French crepes for an epically romantic Valentine's Day breakfast. The Nutella and fresh strawberries really push this recipe over the edge. Pretend you are in a Parisian Cafe this Valentine's Day! Blood orange sangria is super pretty and easy to throw together in the morning or afternoon! Add in apples or raspberries to make this sweet, boozy treat! Use these adorable pancake molds to create cute heart-shaped pancakes for Valentine's Day!